A smart attaché case is essential for business people. When Samsonite launched the Samsonite Classic in 1962 it defined the look of the modern attaché case. Echolac claims to have made the world's first ABS (Acrylonitrile Butadiene Styrene) attaché case in 1965. ABS is the same material that is used to make Lego. The claim is plausible since the company was in the chemical industry and it registered the Echolac trademark in 1965. But, I have only seen advertisements for Echolac cases from 1967 onwards . Echolac cases were made from moulded sheets of Kodoma Chemical's ABS. The advertisements claimed that they were shock-proof, heat-proof and weather-proof. The original cases had a leather look finish. Echolac sold cases in the Asian market in the 1960s. I have seen them advertised in Singapore, Taiwan and the Philippines, as well as Japan. They did not sell in the USA or Europe in the 1960s. 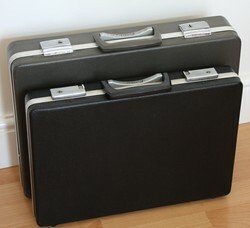 The Echolac attaché cases looked similar to the Samsonite Classic, though the first Samsonite case used PVC not ABS. The original Echolac range was the KN-8. They are primative by modern standards. There is a removable PVC folder which contains spaces for pens and business cards. The inside has a brushed nylon finish. Echolac cases found favour with politicians. The Australian Senator, Neville Bonner, who was the first Aboriginal Australian to become a Member of the Parliament, had an early Echolac case. See artsandculture.google.com/asset/briefcase-belonging-to-neville-bonner. Echolac introduced several different models in the 1970s. When Samsonite introduced the Classic 100 with a combination lock in 1972, Echolac matched it a year later.